The Forum Eurovision Song Contest 2012 was be the 5th annual regular Forum Eurovision Song Contest. The contest took place in Tel-Aviv, Israel, following Epiphony win in the 2011 Contest with the song "More than you know". 41 countries participated in the contest. With the exception of the host country, the rest of the participating countries were divided into 2 semi finals. Only 10 countries from each semi final qualified to the final, making the final consist of 21 countries. The logo and theme was designed by a Syrian designer as an act of peach. The theme "Hora 'till Dawn" was chosen to present Tel-Aviv as the first Hebrew city as well as The city that never sleeps. That was the first time Israel hosted the regular edition of FESC, however, the nation has won once in the history edition, in 1997 with Ofra Haza. The contest was won by DJ David Guetta from France, accompanied by female singer Sia from Australia with the song "Titanium" which was written by Guetta. "Titanium" earned a total of 159 points, placing it in the top spot. Tunisia debuted and finished in second place only 4 points behind France. Spain earned the 3rd spot, Estonia the 4th and Luxembourg the 5th. Ironically enough the semis were won by Tunisia and Spain, with France coming only 8th in the first semi. Israel won the FESC 2011 with "More than you know" performed by Epiphony, bringing the hosting of the contest to the Middle East nation of Israel, and its city of Tel-Aviv. Tel-Aviv-Yafo is is the second most populous and 2nd largest city in Israel. The city is located on the Israeli Mediterranean coastline in central-west Israel. Tel Aviv and Jaffa (Yafo) were merged into a single municipality in 1950, two years after the establishment of the State of Israel. Tel Aviv is an economic hub, home to the Tel Aviv Stock Exchange, corporate offices and research and development centers. It is the country's financial capital and a major performing arts and business center. It is known as "the city that never sleeps" and a "party capital" due to its thriving nightlife, young atmosphere and famous 24-hour culture. Tel Aviv's White City, designated a UNESCO World Heritage Site in 2003, comprises the world's largest concentration of Bauhaus buildings. On 19 October 2011 a bid was open to select the host city. On 29 November 2011 Tel-Aviv was announced the host city after winning the bid, leaving the Capital Jerusalem, muliticultural Haifa and tyhe resort city of Eilat. The Nokia Arena was chosen to be the vanue for the contest. The IBA published the FESC 2012 rules on 19 October 2011. The results format of each show remained the same with each country's votes being decided by a national jury. Each participating country had their own national jury. It was decided that each country can vote, but votes will be calculated differently. The votes from countries participating in that semifinal will be counted as individual votes. Faling to vote in time will cause disqualification and they'll lose their opportunity to participate in the final, even if they'll qualify. Other votes, from countries participating in the other semi or not participating at all (outsiders votes) will be calculated as one international jury vote. In the final all the countries that participate in the final must vote while semifinalists are not obliged to vote. In the final every vote of final or semi final participant will be counted as an individual vote. No outsider voted in the final, but if it would, all outsiders votes would be calculated as one international jury vote. On 22 October 2011 an IBA official revealed the favorites names for hosting the FESC 2012: Actress Ayelet Zorer, singer and actress Mira Awad, news presentors Danny Deutsch and Yair Lapid and singers Shiri Maimon and Moshe Peretz. Rumors that the Epiphony duo, Meital De-Razon and Itay Kalderon, will host, has been denied. In spite of the initial denial, Meital De-Razon, half of the Epiphony duo was declared the female host. News presenter Danny Deutsch was chosen as the male host. Mira Awad got to host the draw. The draw for semi finals was held on January 8th 2012 hosted by Mira Awad. The draw determind both the draw of the countries between the two semis and their position within the semi. 20 songs were eventully featured in each semi final. The draw for the final was held on February 11 2012 hosted by Mira Awad. The draw took place after the qulifiers for the final were known and it determined the position of each finalist in the final. The design of the contest is built around the motto "Hora 'til Dawn", inspired by Tel-Aviv's image as "The first Hebrew city" (Hora - a folk dance) and as "The city that never sleeps" ('til Dawn). 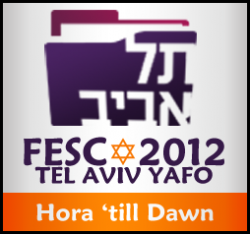 The official colors of the FESC 2012 were purple, orange (colors that a reminding the sunset and night life in Tel-Aviv) and white (for Tel-Aviv being "The White City". A Star of David was featured in a few designs and posters of the event, taken from the Israeli flag. The official logo had a purple computer folder with the Hebrew word "Tel-Aviv" in white written in the middle of it. A Star of David symbol was portrayed beneath it, between the words "FESC" and "2012". The slogan "Hora 'till Dawn" was written in white with an orange background at the bottom of the logo. The sub-logo used a large purple rar. file icon with the slogan "Hora 'til Dawn" portrayed in the middle of it in black over orange background. The skyline of Tel-Aviv was portrayed beneath it, using a sound wave, instead of the city's buildings. The skyline was taken from the Tel-Aviv skyline as it's presented in the city's official symbol. Beneath the sound wave there's the sea, that symbolizes the mediterranean sea, with orange Stars of David in different sizes across it. Each country and its draw portrayed by a dancing humanoid MP3-like file. Standing next to each other the draw file and the country file seemed like they're dancing together. The scoreboard used the elements above and presented the result from each jury as a computer network that enters data into the database. 41 countries took part in the FESC 2012. Belarus and Monaco withdrew at the last minute, while Austria entered the competition at the last minute. Austria, Azerbaijan, Belgium, Bosnia & Herzegovina, Cyprus, Georgia, Greece, Hungary, Lebanon, Luxembourg, Romania and San Marino returned to the contest after a year or more of absence. 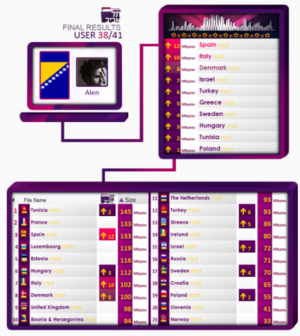 Besides Belarus, Latvia, Malta and Montenegro decided not to enter a song to the FESC, after taking part in FESC 2011. Two countries changes their entries during the song submission period. Estonia withdrew Kerli's entry "Zero gravity" entering Laura "2020" instead. Ukraine withdrew its original entry "I don't know why" by Vasiliy Bondarchuk feat. Santa and entered "My love" by NikitA instead. The change appeared to be a good decision for Estonia, as Laura ended 4th in the final. It was less fortunate for Ukraine after NikitA failed to qulify to the final. France, who won the contest, was the first country to select its entry. Mika who won FESC 2007 returned this time to represent Cyprus, but failed to qualify to the final. Chisu represented Finland in Summer 2008 and again in 2010, where she won. This time around she failed to bring her country to the final. Host country Israel entered new duo The Young Professionals. Ivri Lider, half of the duo, took part in FESC 1999 where he ended 2nd. This time he settled for the 15th position. Nataša Bekvalac returned as well after ending 18th for Serbia in Summer 2010. This time she didn't qualify. Lena Katine, who participated in FESC before as part of the duo t.A.T.u, represnted Russia this year with "Never forget", which ended 16th. More succesful was the Estonian Laura that returned to the contest after ending law in 2008 and 2009. She ended 4th and improved her FESC personal record. The small poll was used to predict both the result of the semi finals and the final. It perdicted the first semi would be won by Cyprus, France or Spain. Spain indeed won the semi, France came 8th and won the final, while Cyprus ended out of the top 10. The poll was right predicting the qualifiction of France, Spain, Sweden, Ireland, Italy, Netherlands and Turkey. It failed to predict the qualification of Estonia, Bosnia & Herzegovina and Greece. Instead it suggested Cyprus, San Marino and San Marino would qualify. In the 2nd semi Croatia or the UK were opted to be the winner. Tunisia who won the 2nd semi, came only 16th in the poll. The small poll predicted the qualification of Croatia, UK, Hungary, Denmark, Russia and Norway. It failed to perdict Luxembourg, Poland, Tunisia and Slovenia qualifying. Instead it stated Finland, Iceland, Portugal and Germany or Romania to qualify. For the final it predicted the UK would win by a big margin. UK ended 9th eventually. Tunisia and Denmark was predicted to be 2nd-3rd and Estonia to be 4th. Tunisia indeed ended 2th and Estonia 4th, while Denmark ended only 8th. France, who won the final, wasn't considered a hot favorite. Before the semi finals, the UK and Sweden tied for the top spot in the poll. Croatia, Cyprus an France were equal 3rd. They were followed by Italy and Switzerland on 6th and Denmark and Luxembourg on 8th position by the poll. Though being 19th according to the betting, Tunisia and Spain won their individual semi finals. After all finalists were known, the UK once again was expected to be the winner by a small margin. France climbed and was was opted to end 2nd. It eventually went on winning the contest. Sweden stayed a favorite, but dropped to 3rd in the polls. It ended only 18th in the final. Ireland and Denmark were suggested to end 4th and 5th, eventually ending 8th and 13th. Tunisia, the eventual runner-up was predicted to end 6th. The Big Poll failed to predict Spain result in the top 3, and considered it outside the top 10. Each country had a jury who awarded 12, 10, 8, 7, 6, 5, 4, 3, 2, 1 points for their top ten songs. Juries were called in the order of their country's performance. First voted the semi finalists who didn't qualify to the final, and later came the finalists in order of appearance. In early stages of the voting different countries took the lead: Luxembourg, Italy, Sweden, Greece with Tunisia reappearing as the lead-of-board a few times. After Azerbaijan's vote Tunisia opened a gap and stayed on top for a while, with Luxembourg hanging on on 2nd position. With the Netherlands' vote, Estonia took the lead away from Tunisia, until Estonia were called to vote. Giving Tunisia another set of 12 points made Estonia drop to 2nd position and Tunisia back on top. Tunisia stayed on top, while France and Spain moved ahead as votes were called in. The penultimate jury from Slovenia gave its 12 points to France, leaving Tunisia with nothing. At that points only Tunisia with 145 points could caught France who gained 157 by then. The last jury from Denmark gave France 2 points, which was enough to award it its victory. This page was last edited on 22 March 2013, at 01:11.